Intel recently launched the first batch of their 8th Generation Coffee Lake Processors. 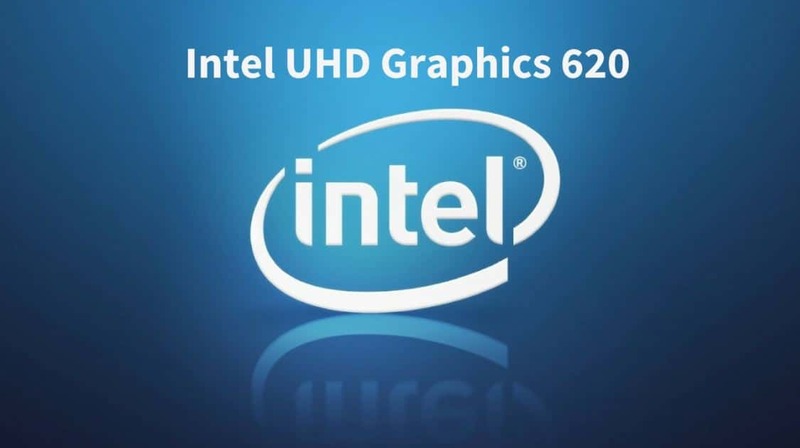 The Intel UHD Graphics 630 is the iGPU in all the chips launched so far. There’s a remarkable performance improvement in the 8th Generation Intel Processors compared to Kaby Lake. Today, we are going to have a look at the Integrated GPU of Coffee Lake Desktop processors and what games and applications that you can expect to run without any issues. So far, the processors that have the Intel UHD Graphics 630 GPU are Core i3-8100, Core i3-8350K, Core i5-8400, Core i5-8400K, Core-i5 8600, Core i7-8700, and the Core i7-8700K (Check on Amazon). Even the 9th Generation Desktop Processors have the same GPU. That includes the Core-i5 9600K (Check on Amazon), Core-i7 9700K, and the Core-i9 9900K. The Apple Mac Mini 2018 (Amazon) also has this Integrated GPU. Make sure that you don’t get confused by the naming conventions used by Intel. UHD Graphics 630 is for 8th Generation while the HD Graphics 630 is for the 7th Generation. There is a minor improvement in UHD 630 and you’ll get some extra FPS in most of the games. However, you shouldn’t think of gaming at Full HD as in most of the games you will not even get a playable frame rate. You’ll have to stick with 1366×768 or 1280×720 resolution and change the graphics settings to low in most of the games. Apart from a slightly higher clock speed, OpenGL Verison, and Architecture, there are not any significant changes over the previous generation. It seems that currently, Intel’s main focus is on making discrete GPUs for their chips with the help of AMD. Should Nvidia worry? Coming back to the specification, this graphics processing unit is based on the Coffee Lake architecture that is fabricated using the 14nm technology. It has 23 execution units with a base clock frequency of 350 MHz. The max clock frequency is 1.15 GHz for i5-8600K and i3-8350K. While the Max clock speed of i3-8100, i5-8400, and i7-8700K is 1.1 GHz, 1.05 GHz, and 1.2 GHz respectively. It can support a maximum graphics memory of 64 GB. The DirectX and OpenGL versions are 12 & 4.5 respectively. 4K Display is also supported and that is 4096×2304 pixels. At once, you can connect maximum 3 monitors to your PC. The other technologies it includes are Intel Quick Sync and the Intel Clear Video Technology. How much is the Video Memory of UHD 630? Being an Integrated GPU, the Intel UHD Graphics 630 doesn’t have any Video/Graphics Memory of its own. Instead, it utilizes the system’s memory (RAM) dynamically for the same purpose. You can change the maximum Video Memory from the BIOS settings. This data from the PassMark Benchmarking Tool should give you an idea of the performance difference between Intel UHD Graphics 630 and other similar Integrated and Dedicated GPUs. The Intel HD 530 is an Integrated Graphics Processor for the Intel 6th Gen Skylake Processors. Even though the difference in scores isn’t huge, there is a significant difference between the real world performance of these two. Here are two of the Nvidia’s low end dedicated GPUs. The GeForce GT 730 is quite old now while the GT 1030 has launched recently. There is a huge difference between an entry-level dedicated GPU by Nvidia and an Integrated GPU by Intel. If you have a low-budget, you can always consider buying the GT 1030 that can run every game at a decent frame rate. But for even better performance at 1080p, don’t look at anything below the GTX 1050 Ti. For a decent playing experience, there’s no other option but to change the display resolution and graphics settings to low. Older games can even be played at 1080p, but you should stick with 720p for new games. For Counter-Strike: Global Offensive, the performance is not that bad. At the settings mentioned above, you’ll get more than 100 FPS. Hence, you can either switch the resolution to 1920×1080 or stay at the same resolution and increase graphics settings. Another popular PC game is Grand Theft Auto V which is not that high-demanding. On average, you should expect around 50-54 frames per second playing GTA 5 on low settings. The Elder Scrolls V: Skyrim is another popular game that you can enjoy at a good FPS. Switch the graphics settings to medium and enjoy Skyrim and 60 FPS. Intel UHD Graphics 630 is also good enough to play FIFA 17 and FIFA 18 at above 60 FPS. 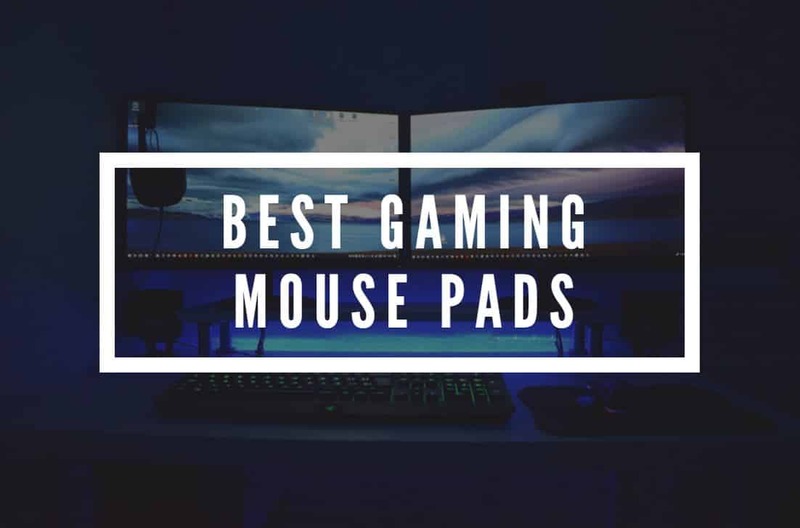 You’ll also not face any problem in other popular games like Tomb Raider (2013), Overwatch, Battlefield 1, Batman: Arkham Origins, and Arkham City, Max Payne 3, Sniper Elite 2, Far Cry 3, Fortnite and other such games that do not require a very powerful GPU. 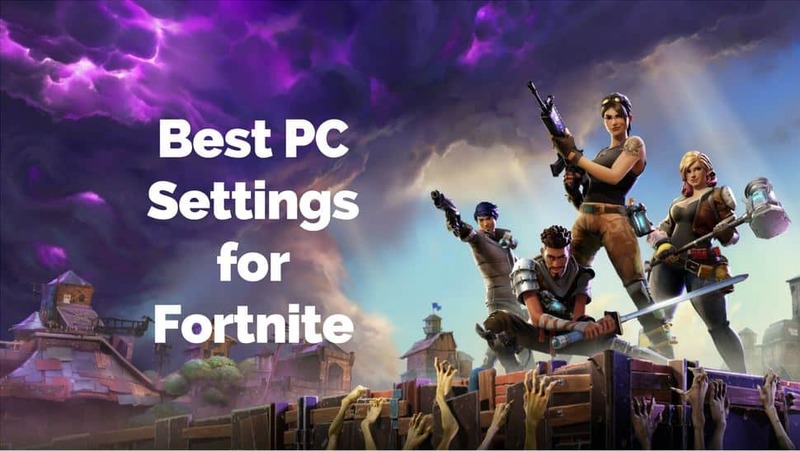 Fortnite is playable at a decent FPS on low/medium settings. Now if we move onto some higher demanding games like The Witcher 3, PUBG, Rise of the Tomb Raider, Batman: Arkham Knight, the performance starts to drop significantly. On 720p and lowest possible settings, you will only manage around 20 Frames per second on The Witcher 3. Even the playing experience on games like the Rise of the Tomb Raider and Far Cry Primal won’t be that good. So, don’t expect a very good gaming performance in high GPU power demanding games. Guess What? You can increase the FPS on Intel UHD 630 by just applying a few tweaks mentioned here. Well, most of you would have got an idea of raw performance and gaming performance with the help of the above benchmarks. Yes, the performance of Integrated Graphics is improving every year, but in case of dedicated GPUs, the performance is skyrocketing. For professional gaming and high-end productivity work, and doing other stuff like Machine Learning, Cryptocurrency Mining, Video Rendering, and Designing, a dedicated GPU is a must. 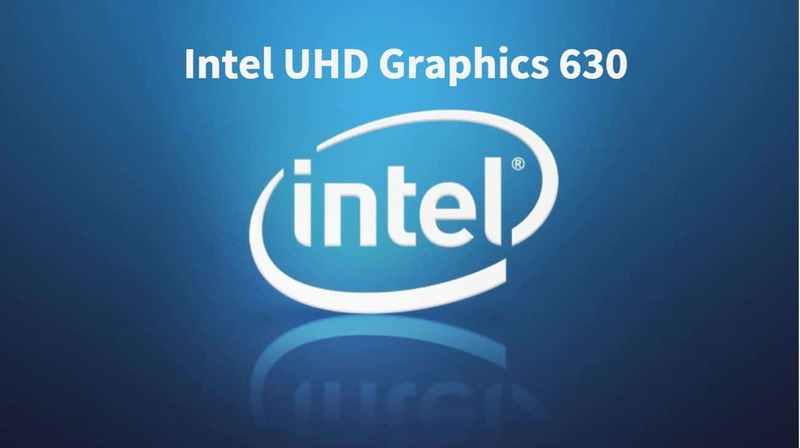 But for basic usage, light-gaming, and 4K video playback, the Intel UHD Graphics 630 is more than sufficient. If you need better performance but have a very low budget, you can go with the Nvidia GeForce GT 1030 at just $79. If you’re an AMD fan, you can choose the AMD Radeon RX 550 instead of GT 1030. These two entry-level GPUs good enough to accelerate your video rendering applications and games. For even better performance, the GTX 1050 Ti or the AMD Radeon RX 580 or the GTX 1060 is what you should pick next. If I had to buy a good dedicated GPU for these powerful 8th Generation Intel Processors, I would not look anything below the GTX 1070. Another great option is to wait for the next gen GPUs by Nvidia and AMD. As per the early rumors, the Nvidia Volta Series will pack a lot of fire-power and it is likely to launch in early 2018. Nvidia has already launched the first GPU based on the Volta architecture and that is the Nvidia TITAN V.
Can it be used for Rendering and Productivity Applications? 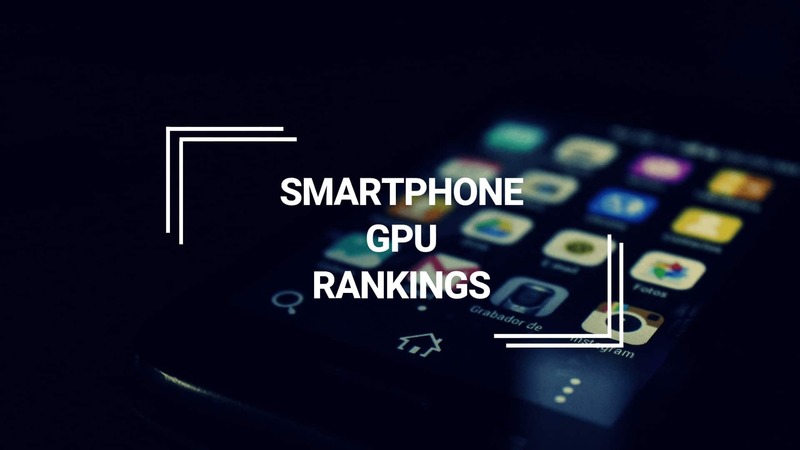 For any kind of productive work or running GPU intensive applications like Video Editors like Adobe After Effects, Camtasia Studio, and for other work like SolidWorks, AutoCAD, and Game Development, I will not recommend sticking to an Integrated GPU. Yes, this iGPU can run those applications but the performance would be below average and video rendering would take too much time. If content creation and productivity is your primary requirement, then give preference to a better GPU. Even pairing up a GTX 1050 Ti with a 6th or 5th Gen Intel Processor would yield a better result than using an 8th Gen Processor without a dedicated graphics processor. These ratings are obviously not based on its performance or on its comparison with other powerful dedicated GPUs. The below ratings are solely based on the fact that its an Integrated GPU and on its comparison with the previous generations of Intel iGPUs. I like this article. Having used the integrated graphics on Kaby Lake I5 7500 the HD 630, I was impressed using it for every day use. I never had any issues and it seemed to be very responsive. It seems like they could scale this to a discrete graphics card and do some decent gaming. How can the the 7. 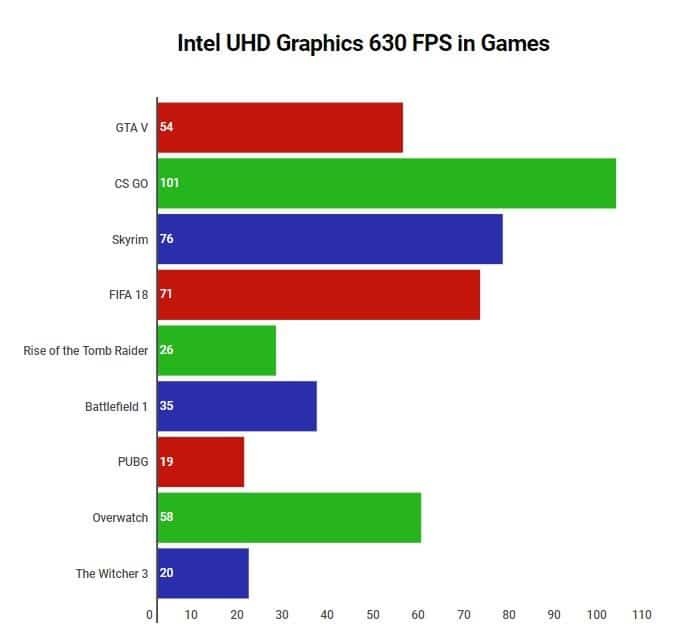 Gen. HD Graphics 630 be 1.35 times better then GT 730 in this test https://www.techcenturion.com/intel-hd-graphics-630 when this article tell us that 8. Gen. UHD 630 is about 15% better then HD Graphics 630 but only 1.28 times better then GT 730?? Benchmark tests are not always that accurate. All the three GPUs (HD 630, UHD 630, and GT 730) are low-end cards and are quite similar in performance. The results may vary from application to application. Also, using the benchmark to measure the percentage improvement may not yield accurate results. For example, A piece of Hardware with a Benchmark score of 2,000 is not two times better than another hardware with a score of 1,000. Here’s the simple equation that should solve your query: UHD 630 > GT 730 > HD 630. Is this something you should/could (in some situations) pay attention in real world use?